I didn't choose this profession, but fell into it. My educational background is in finance and economics with an accounting minor. I spent the first 16 years of my career in finance, economics, and technology roles. I managed a team of developers and program managers when mainframes were part of Corporate America. Also, I worked on many projects that required thinking of ways to improve or make processes more efficient. When I served as the Chief of Staff for Citi's Institutional Clients Group's CIO who oversaw 15,000 developers and a large budget, I helped him manage the team. But 5% of my job consisted of interacting with developers to make sure they had the tools to do their job, and 95% was spent on budgets, vendors, and projects. I liked the 5%. One day during a performance review, my manager asked me what I liked about my job. I said I loved my job in technology, but I'd really like to focus more on the people component - blurting out that I would like to be the head of diversity. Not because I knew much about diversity, but since in technology you're often dealing with things that break, stop working, or go wrong. I saw what the head of diversity at that time was working on and found it interesting. I wanted to work on something that directly impacted a person while having some balance. Well, call it good fortune, but the diversity officer resigned several months after that conversation. And the head of HR mentioned it to my boss who - like any good manager that wants to see their high-performing employees succeed and love what they do - submitted my name for the position. Truth be told, it was a shock because I did not expect my boss to tell my secret. But sharing my dream led me to where I am today. Remember how I told you that the diversity officer positon was offered to me after I said that I wanted that role? Would you believe that I turned it down three times? I wanted to work more with people, but I had no idea what the diversity officer's job actually was or what was required. I didn't want to leave a job where I knew what was expected of me, and where I was exceeding those expectations. Meanwhile, the senior leaders along with a fair number of my advocates at the firm were fully supportive. They encouraged me to take the diversity position. After much thought, I decided to take a risk, follow my passion, and get over my fears. I decided to take the job and do it with a vengeance. With the unconditional support of senior management, I was able to implement a diversity strategy, build a framework for the job function and new diversity platform, and create a team to execute my plan. As the new head of diversity, I was curious to understand what people thought my job was. So I called about 200 people across the firm and asked them what they thought the Diversity Officer's job actually was. Based on their feedback and the skills I had developed throughout my career, I developed a plan to improve diversity at the company. I leveraged my transferrable skills in technology and finance, and made sure that we had processes and mechanisms to have metrics around our work. We tracked our initiatives, measured progress, and made sure that we could scale our initiatives to ensure the projects were successful. We could understand the "ROI" and were able to scale. I also made sure that I communicated to the firm what the function of the diversity team was and was not. When I made this transition from technology to diversity, I had no idea I would, or even could, have a career in this field. Fifteen years later, I can say that taking this role was the game changer for me. 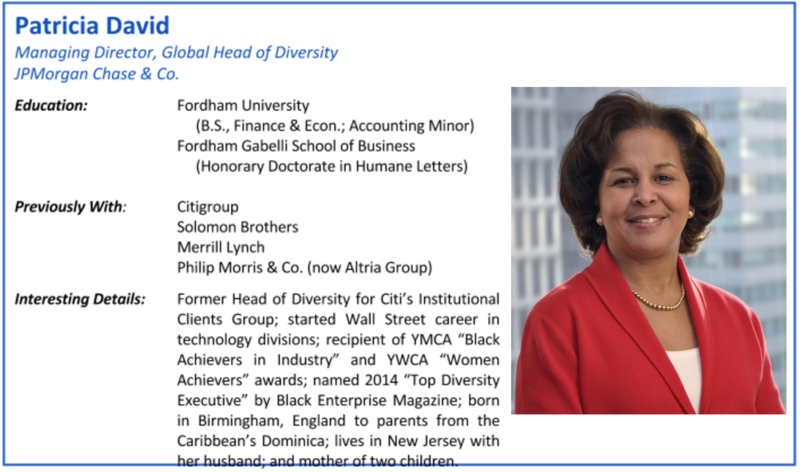 All of my experiences to date enable me to bring the right insight, perspective, and expertise for this job - where today I'm the Global Head of Diversity at JPMorgan Chase. My skills, combined with my personality and ability to articulate business reasons for why we do things, my ability to track and measure, and my background as a manager on the business side - these have given me an understanding where I can appreciate what managers go through and can talk about things pragmatically in layman's terms. I can speak in relatable terms while driving change for the organization. My biggest challenge was one of my first experiences when having to deal with "the real world" after college. I walked into my first job interview and before even starting our conversation, the woman interviewing me said, "We're going to hire you." She said this right on the spot. I said, "Oh, that sounds great. Can you tell me why? Was it my experience at Burger King?" I had been a manager at Burger King on Fordham Road while in college at Fordham University. It was my first real job, and it was the only work experience I had at that time. I had a high GPA, studied hard, and got good grades. But I was really curious to know why she wanted to hire me. She responded, "We're going to hire you as our first Affirmative Action hire." I looked at her and said, "You must have me confused with someone else." I walked out. The challenge for me was that I didn't want to be put in a box and not held to a baseline standard. I had to be brave and say that I believe I'm good enough to find a job on my credentials and not merely based on my skin color. From that moment, I've never allowed anyone to put me in a box again - refusing to be stigmatized. Having access to opportunities is important for minorities, but so is being judged on what you bring to the table and seen as qualified. Interacting with people and making human connections. And knowing that I don't know everything. I'm the head of diversity, and I'm a culturally-sensitive person. But I'm not an expert on cultural dexterity in every corner of the world. I'm smart enough to know that I don't know everything. So I rely on others. I always hire people that are smarter than me - who want to do the jobs that I have within my purview - and I give them the tools they need to succeed. Also, I know how to use Excel, PowerPoint, and Word, which comes in very handy. I know how to roll back my sleeves and get the job done alongside them. I don't ever look at any negotiation as being difficult. I like what Stephen Covey says in his book "7 Habits of Highly Effective People." And one of the things he talks about is the "win-win." I never look at a negotiation as in terms of winners and losers - that someone is going to lose. I don't approach things with my heels dug into the ground since that's not helpful in reaching solutions and agreement. The moment I have to negotiate anything - no matter how big or small - I try to understand clearly what the driver is behind the other person wanting their desired outcome. I look for where the diversion is between what they want and what I want, and I always look for a positive outcome for both parties to win. I pride myself on being a good listener. Sometimes just maybe they may be right and I may be wrong - I pride myself on being open to the possibility that they may be right. I think my value proposition is that I'm the real deal. I'm humble in my success, open and honest, and don't put on airs. I'm not preoccupied with how big my office is or how big my paycheck is. I think my personal background resonates with a lot of people from various backgrounds - I grew up in the South Bronx and had my share of being on government support (food stamps and government cheese, etc.). I worked hard during my school years and continue to do so 35 years into my professional career. I didn't go to an Ivy League school, and wasn't looking for a job in finance like a lot of young people do now. I thought Wall Street was an actual street. Now I know that it's an institution. I was lucky, but I was also good. Hard work, not taking anything for granted, and remaining humble - that's my testament to where I am today. I look back and feel very lucky every day. I've been privileged to work at some of America's greatest companies - not only in the financial services industry since I also worked at Philip Morris after college. I thank my stars when I go to bed at night. Death and disease don't discriminate. I keep it real and live each day without regrets. I think it surprises people that I'm that comfortable in my own skin. I can't change history, and I can't change the things that I can't control. But all of my life experiences enable me to treat people with respect in any setting. My mother immigrated to the United States to give my brother and two sisters a better life. She sacrificed her own life so that we would have opportunities. I worked hard in school so that it wouldn't all be for naught. But my proudest achievement to this day is that I was there during her last days. She died in my arms. She was diagnosed with Alzheimer's disease about 10 years ago. I hadn't realized how much her health had actually deteriorated until I went to visit her on vacation in Dominica in the Caribbean. Whatever she wanted her kids to be and for all the sacrifices she made for us - she can rest in peace knowing that immigrating to the U.S. from England in the late 1950s to help her children have a better life was a success. We "done good" as a family! I only wish she were here to watch me receive an Honorary Doctorate from Fordham University this year. In my speech that I gave about my life and career, I testified about the role my mother played in my life and that her sacrifice was duly paid. And for that, I will be forever grateful and thankful.